There are many kinds of "stock prices" and there are also many ways to access those prices. This article explains the different types of stock price data available through the Intrinio Marketplace and the different ways investors, developers, startups, and enterprises can access those prices as well as the cost for subscribing. What Stock Prices and Access Methods are Available? 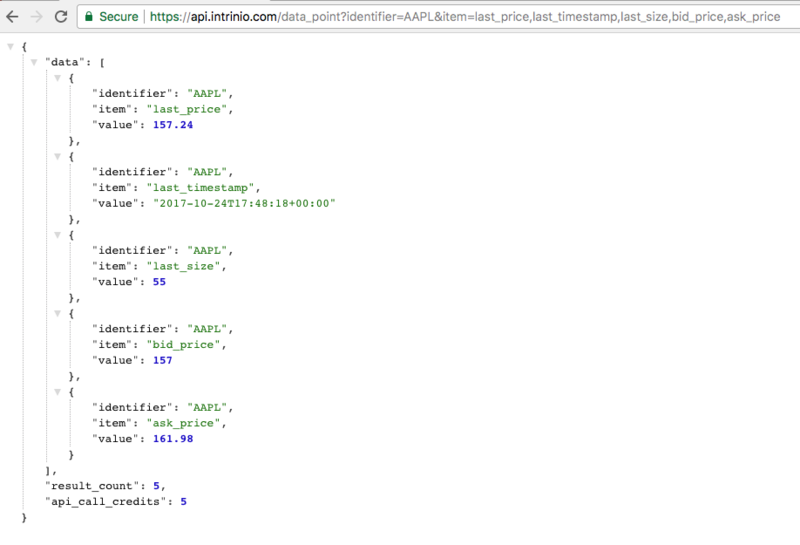 If you are using the API, it can be helpful to note that the securities endpoint can be called with an optional parameter, last_crsp_adj_date, that returns a list of securities that have adjusted their stock prices due to a corporate event. This parameter is useful for configuring your application to only update historical prices if they have changed. Pulling EOD prices via REST-API makes sense for EOD prices or real-time prices if you don't need to update the data very often. If you want to truly stream a high volume of real-time prices, a websocket API will work better. Whereas the REST-API limits the number of calls you can use in a day or minute, websocket subscriptions allow an unlimited number of price updates from a limited number of stocks. Intrinio is working to expand websocket coverage to all North American exchanges and currently offers websocket connections from the IEX and NASDAQ exchanges. Startups, individuals, developers, and enterprises have self sign up options as well as some excellent real time SDKs, to get started immediately. These websocket options make it easy to stream prices from popular exchanges. If you have questions about which exchange, API type, subscription, or SDK you need, feel free to chat with our team. 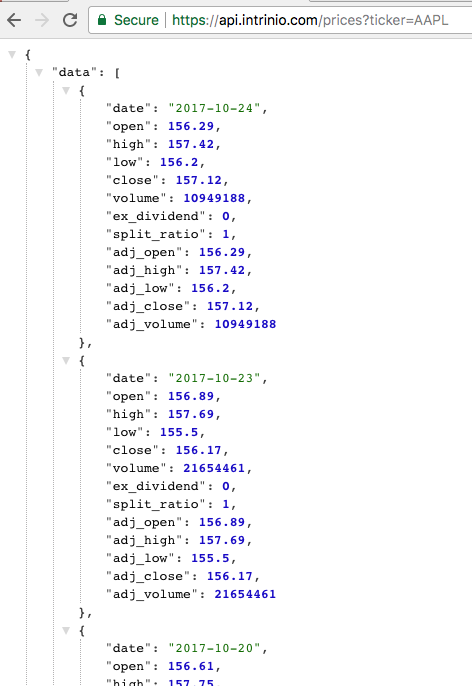 This same "=intriniodatapoint("identifier", "tag") formula can be used to get international EOD prices and EOD options prices as well. The historical data include adjusted data points that account for splits, reverse splits, and dividends. Index prices don't include adjusted figures since indexes don't have splits or dividends. If you have questions about the proper syntax, feel free to try the API explorer, it builds the syntax for you, and you can always chat with our team. For most users, Intrinio lists the different subscription plans right on each product page. Details of the price, whats included, the limits, and terms, are transparent and you don't need to talk to a sales person. Just go to the marketplace, search for the data you need, hit more info, and you'll see all of the information. For most data feeds, Excel users and API users can choose between individual, startup, and enterprise. These plans vary based on the data feed, and not all plan types are available for all data feeds. Do I need to redistribute this data or is it for my own, internal use? Do I qualify as a startup, making less than $10,000/month with less than $200,000 in funding? If so, do I qualify for the startup program as well? Do I need a large amount of data or just a few daily datapoints (this article explains how we count data points)? Its important to note that websocket APIs are priced slightly differently than rest APIs. Whereas data feeds that are available in Excel and via Rest API are priced based on the amount of data used per day and how the data is used, websocket APIs, including the NASDAQ and IEX exchanges, are priced in terms of concurrent connections and daily connections. The professional IEX plan, for example, allows for up to 100 concurrent connections at a time, meaning the real time prices for up to 100 stocks can be obtained with a continuous flow of new prices as they are updated on the exchange. The plan allows for a total of 100,000 total daily connections, meaning a user can connect to up to 100,000 different security pricing feeds over the course of a day, changing them as necessary. The NASDAQ websocket has similar plans: non-pro and professional. The most affordable one streams up to 50 tickers in real time with the highest one streaming up to 3,500 tickers. For plans and pricing click here. Stock prices are complicated- there are many types of stock prices, many access methods, and even different exchanges and legal requirements to consider. Our support team is really experienced at helping all types of users find the right data, the right subscription, and the right syntax to start pulling data. Just ask, and we will make it easy for you. There are many reasons to work with Intrinio in addition to free chat support. Probably the best reason to work with Intrinio is that we are the good guys- we are here to help you get the data you need so you can be successful.